The British government provides millions of pounds annually, through direct and indirect funding processes, to highly politicized non-governmental organizations (NGOs) that operate in the UK, Israel, the West Bank, and Gaza. NGO grantees receive direct funding from the Department for International Development (DFID), the British National Security Council (NSC), and the Foreign and Commonwealth Office (FCO), with funds disbursed by UK embassies, consulates, and representative offices. Indirect NGO funding comes from aid frameworks such as Christian Aid, Oxfam-GB, and the British Council, which all receive significant funding from the British government. The Department for International Development partners with and provides funds to politically active international NGOs including Norwegian Refugee Council and Ma’an News Agency (MNA) / Ma’an Network. DFID is funding seven active projects in the West Bank and Gaza for 2018-2019, with a total budget of £60 million. Information on projects funded by the DFID is available in a projects database. However, local NGO recipients and third-party recipients of UK funds via international organizations do not appear on the website. 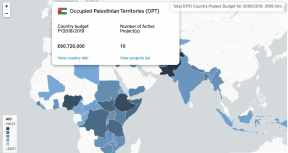 In July 2018, DFID released an updated profile for its work in the West Bank and Gaza, indicating that the planned budget for 2019-2020 would be £56 million. On June 10, 2017, Minister of State, Foreign and Commonwealth Office and Department of International Development Alistair Burt announced the allocation of £3 million over three years (2017-2020) to fund a co-existence or “people-to-people” programs. According to DFID, the project, called “Partnerships for Peace,” is implemented by an NGO, Search for Common Ground (SFCG). Support to Palestinians at Risk of Displacement in Israeli Controlled Area C of the West Bank and Gaza [GB-1-203452] £3,776,462 (2013-2018) Multiple UN agencies Details of third party NGO recipients and amounts are not listed. Norwegian Refugee Council (NRC) is mentioned as a partner in accompanying documentation, but details and amounts are not available. In 2017, DFID granted $4,000,000 to NRC’s Information, Counseling, and Legal Assistance (ICLA) project, which exploits judicial frameworks to manipulate Israeli policy, bypassing democratic frameworks. NRC supports politicized “Litigation of public interest cases …through Israeli courts and international mechanisms.” In 2009-2014, NRC funded over 4,000 cases and legal interventions in Israeli forums. NRC works with a narrow selection of political NGOs that promote a one-sided narrative of the conflict in implementing its legal aid and “public interest litigation” related programs. In 2016 and 2017, NRC partnered with HaMoked, JLAC, Society of St. Yves, Terrestrial Jerusalem, Yesh Din, CAC, Bimkom, Palestinian Centre for Democracy and Conflict Resolution (PCDCR), Palestinian Centre for Human Rights (PCHR), Al Mezan, among others. Local NGO recipients and third-party recipients of UK funds via the NRC do not appear on the UK government transparency website. Ma’an acts as a platform for tendentious anti-Israel statements, regularly presenting an entirely biased and distorted view of the conflict based on the Palestinian narrative of victimization and sole Israeli aggression, while also publicizing material from radical NGOs. 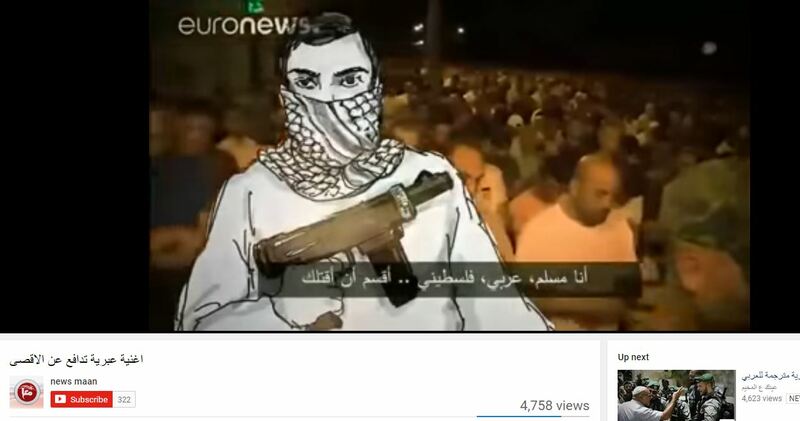 On August 1, 2017, Ma’an published an article and a video titled “Song in Hebrew in Defense of Al Aqsa Mosque,” which featured footage of terrorist attacks against Israelis, accompanied by a song in Hebrew with the lyrics “I will clean my country of every Jew / I will strive for it with all my being” (NGO Monitor translation). The article reported that it “promises to clean Palestine of Jews, and protests against Israeli security measures,” with Ma’an adding commentary that “Israel deteriorated the situation in Al Aqsa mosque when it installed metal detectors in the entrance to Al Aqsa compound” (NGO Monitor translation). In correspondence with NGO Monitor, Minister of State for International Development and Minister of State for the Middle East at the Foreign and Commonwealth Office Alistair Burt confirmed that DFID was ending its projects with Ma’an. In 2016, due to reports that UK foreign funds to the PA were being used to pay salaries of convicted terrorists, the FCO mandated that Palestinian aid be directed through the European Union’s PEGASE mechanism (Palestinian-European Socio-Economic Management Assistance Mechanism). Despite assurances of vetting and verification procedures, FCO does not give details of third party NGO recipients and funding amounts. Information for 2015-2018 taken from quarterly reports submitted to the Israeli Registrar of Non-Profits. In 2016/2017, Christian Aid received £42.1 million from governments and institutions, the majority of which came from DFID (£20 million); other major contributions came from Irish Aid £4.5 million and the European Commission £1 million. According to Christian Aid, none of its DFID funding was earmarked for Israel of the OPT. Christian Aid does not reveal all of their partners, nor funding to the organizations. Current and former partner organizations include Zochrot, Breaking the Silence, B’Tselem, Al-Haq, Sabeel, Adalah, Palestinian Centre for Human Rights (PCHR), Palestinian Agricultural Relief Committees (PARC), Physicians for Human Rights – Israel (PHR-I), Alternative Information Center (AIC), the Ecumenical Accompaniment Programme in Palestine and Israel (EAPPI), Women’s Affairs Centre in Gaza, Culture and Free Thought Association, and Israeli Coalition Against House Demolitions (ICAHD). In May 2016, released a video titled “Christian Aid’s work in Israel and the occupied Palestinian territory.” The video presents misleading and false information about the security barrier and water usage in the West Bank, and adopts a Palestinian narrative of the conflict. On October 30, 2012, 22 NGOs, including Christian Aid, released a report, “Trading Away Peace: How Europe Helps Sustain Illegal Israeli Settlements.” The report repeats the BDS agenda, calling on the EU and national governments to wage political warfare through various forms of economic sanctions on Israel. In 2014-2017, Oxfam GB received £138.8 million from the UK government. In FY 16-17, Oxfam GB received £8.4 million from DFID. Oxfam GB draws an immoral symmetry between Israeli self-defense and illegal attacks by terror organizations, and fails to acknowledge Hamas’ exploitation of the civilian population of Gaza as human shields. Its statements refer to the blockade of Gaza as the key impediment to peace, failing to mention that the purpose of Israel’s blockade is to prevent the illegal flow of weapons to Hamas and other terror groups. In 2013-2017, Oxfam GB granted NIS 936,272 to Gisha, B’Tselem, Zochrot, Emek Shaveh, and Yesh Din. Millions of shekels are provided by the UK government to a number of highly politicized NGOs - some of the funding is directly granted by government agencies, and other amounts are channelled indirectly by humanitarian aid groups, ostensibly for humanitarian purposes. NGO Monitor prepared a document for Knesset Members and British Parliamentarians for a meeting discussing Antisemitism and Hate Crimes. At the UK House of Commons debate on the UK foreign aid budget, NGO Monitor research was quoted as a source of how funds are being misused and allocated to NGOs whose activities defy UK policy and values. The British government provides millions of pounds annually, through direct and indirect funding processes, to highly politicized NGOs that operate in the UK, Israel, the West Bank, and Gaza. In recent years, the British government has ended funding for a number of Israeli political advocacy NGOs, but it still supports Breaking the Silence, BTselem, and others. UK funding also goes to pro-BDS groups.